Merry Christmas backcountry friends! If you get out today to enjoy the backcountry, you may be greeted by sunshine and nice sliding conditions! Even though we'll have a break in the weather for the next 30 hours or so, don't let your guard down! Remember: Persistant weak layers don't care that it's Christmas! Don't let the avalanche grinch steal your fun today! Generally stable snowpack conditions exist below treeline. Above treeline there are still persistent weak-layers within the snowpack, the Purcell Mountains are where you are most likely to find these weak layers. Human triggered avalanches are not likely; but, will be large and have high consequences if triggered. Moving forward into the weekend there is the potential for stability to decline if the next predicted storm materializes. Continue to practice safe travel habits and keep an eye on the weather. Since December 18th the Selkirks and Cabinets have picked up about 10 inches of new snow. Last night the mountains received another 3-5 inches of new snow and that was accompanied by strong winds and dropping temperatures. That will have created some heavy windloading on all easterly aspects as well as north and potentially northwest. It would be wise to avoid ridgetop loading areas for today and possibly the weekend. Overnight another round of snow has added loading to a pack that was still adjusting from the storms earlier in the week. With winds in the 40's last night, expect to see widespread wind slabs on the leeward slopes and cross loaded gullies. There is still a persistent weak layer in many locations; it was active in pit tests yesterday. Assess each location you plan on riding or sliding to see how reactive this layer is. Strong southwesterly winds and a dose of fresh snow have created sensitive wind slabs on leeward terrain above treeline. Avoid steep slopes (over 30°) on north-east aspects below ridgelines and cross loaded gullies. Pay attention to changes in surface density and watch for "pillows" and "lens shaped" features in the upper snowpack. These windslabs will likely be sensitive through the weekend. The warm temperatures over the past couple days have helped the snowpack heal up quite a bit, especially at the mid and low elevations. There are still several lurking dragons buried at our upper elevations to be aware of. Expect the avalanche danger to increase as this new storm arriving deposits a large amount of heavy, warm snow accompanied by strong winds. Avoid riding on or below slopes steeper than 30 degrees until this snow has had time to adjust. The snowpack looked to be healing quite a bit...until today! A strong winter storm is showing up as I type. Heavy snow and wind will dominate our weather for the next 24 hours. The areas of most concern will be steep, wind loaded slopes as well as slopes near exposed rock outcroppings. My advise is "Be pacient". I anticipate this snow being a good thing for our base but might need a couple of days to stablize. A subtropical storm will push through the forecast area on Tuesday and Wednesday bringing heavy mountain snow and strong southwesterly winds. This will create thick and reactive storms slabs to build above 4,500'. Expect avalanche danger to rise as this storm materializes. Avoid riding on or below slopes steeper than 30° until this snow has had time to settle. Last week's cold, dry weather left us with a blanket of well-developed surface hoar that was subsequently buried by 10 to 15 inches of snow from the Monday through Thursday storms. Especially at higher elevations, this surface hoar was buried intact forming a weak layer under our new storm slab. Strong winds accompanied the new precipitation that came in yesterday and will continue to move snow around creating wind slabs on the ridges and mountain tops. Fresh storm snow and strong southwest winds have created slabs on leeward slopes in high alpine terrain. Below tree line be alert to the possibility to trigger storm slabs in areas where this weeks storm snow is overlying a layer of buried surface hoar. Pay attention to changes as strong winds and additional snow are forecast Friday night into Saturday morning. The avalanche danger is MODERATE with isolated areas of CONSIDERABLE on open windloaded NNE aspects above 35 degrees. Recent new snow and high winds have loaded up these slopes with 4' + windslabs that sit atop an icecrust in the middle of the pack with surface hoar present a few inches above the crust. These layers were found on all aspects at 6000 feet. More snow and winds expected tonight through tomorrow. IPAC will begin issuing regularly scheduled avalanche forecasts beginning this Friday, December 14th. Forecasts will be posted twice a week, Tuesday and Fridays. You can get forecast information here, the IPAC facebook page, and our phone hotline at 208 765-7323. As usual, we are interested in hearing what you are seeing out there. Please help us make the forecast better by posting relevant info on our observations page. IPAC will begin issuing regularly scheduled avalanche forecasts beginning this Friday, December 14th. Forecasts will occur twice a week with days on Fridays and Tuesdays. You can get forecsat information here, the IPAC facebook page, and our phone hotline at 208 765-7323. A strong weather system is currently moving through northern Idaho. Today, expect to see strong winds, snow and freezing temperatures. Yesterday's rain/snow mix saturated the top 6-8'' of the snowpack and made it avalanche prone. Temperatures overnight were cold enough to lock it back up though. I'd expect to see a firm refrozen surface today with places of wind deposited snow on top. I wouldn't expect to see any natural activity today but human triggered avalanches are possible. Consolidated snowpack with firm sun and raincrust with 1 inch of heavy snow on the surface. Watch for cornice releases which have been the triggers for recent avalanches. Sunshine and warm temperatures will destabilize the upper portion of the snowpack throughout the day. Avoid areas where loose wet slides have the potential for pushing you into terrain traps. And pay attention above, cornices become weaker as the weather warms. The snowpack is going through a big change right now. Spring is here...at least for a couple days. The warm temperatures have decreased the stability in the upper portions of the snowpack. We'll hit the climax of this warm weather today (possibly 50 degrees at 5000'). Natural avalanches will be possible today and human triggered avalanches likely. Make wise travel choices today and stay away from solar aspects especially under rock outcroppings. Warm afternoon temperatures will cause the snowpack to weaken as Tuesday is forecast to be another warm and sunny day. Avoid areas where "loose-wet" slides have the potential to injure you by pushing you into trees and cliffs. Cornices and glide cracks are also starting to weaken, the only way to manage this problem is to avoid being underneath them as temperatures rise during the day. The storm that was called off ended up materializing with 6 -8" of heavy, dense snow and gusty SW winds. Watch for windslabs and storm slabs at the high elevations, and windslab development to continue throughout the day. Expect to see loose-wet avalanche activity in the lower elevations today and on the southern aspects as the sun hits them tomorrow. A winter storm has produced snow, rain and wind across the forecast area. 6-8'' of snow has fallen above 4800', but has been moved around with the wind. The winds were primarily out of the SW which means the E-N faces could have significant wind loading. Expect the storm slab at higher elevations to be reactive. Natural avalanches are possible and human triggered avalanches are likely on slopes steeper than 35 degrees. Make good decisions and travel safely. 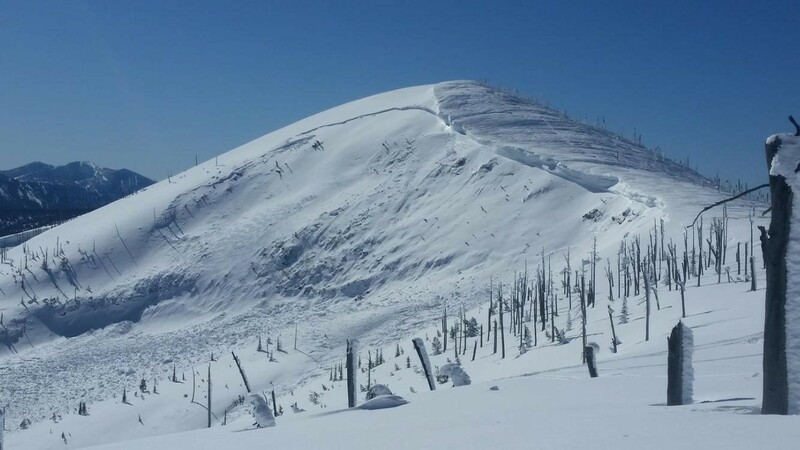 Strong winds and storm-snow have created slabs above 5,000', use caution on all steep slopes over 35.° Leeward terrain directly below ridgelines will be the primary features of concern at upper elevations through the weekend. Expect to see loose-wet avalanche activity at lower elevations and use caution in areas where these slow moving slides have the potential to push you into high consequence terrain such as gullies, trees or cliffs. Small storms, light winds, and mild temperatures have helped stabilized the upper snowpack this week. Caution is still needed in steep, high consequence terrain where loose dry avalanches are a possibility. The persistent weak layer is still showing its face in some locations, so it is important that you check your location by digging down. The Cabinets and Selkirk mountains have been getting light density snow over the past 48 hours. Scroll down to the avalanche problems to see what we're saying about the avalanche danger. IPAC sends it's condolences to the friends and families of the avalanche victims in Washington state. We're sad to report, 6 people have lost their lives in avalanches in Washington over the past week. Know what avalanche terrain is and practice safe travel techniques. Mild temperatures and a lack of wind have stabilized the upper snowpack. Use caution in steep, high consequence terrain on all aspects where loose-dry sloughing could cause a loss of control. Also keep in mind the potential to trigger deep weaknesses in the Purcell Range where the snowpack is thinner and potentially more sensitive to triggers. Stability issues from wind effected snow will be your main concern today. Mountains picked up a couple inches. Temperatures in the mountains remained below freezing and surface snow will be easily transported by the forecast winds today and tonight. New snow is expected and this will also add to stress on windloaded aspects. You'll find good traveling in most terrain but remain cautious of steep lee aspects with cornice formation and sparse vegetation to protect from triggering unstable wind slabs. A series of small storms has been tracking across the Silver Valley, depositing a few inches yesterday and last night. The smaller amounts in these storms accompanied by steady moderate temperatures have allowed these layers to bond, but have provided new fuel for windloading each day. Expect windslab formation at the ridgelines. The moderate temperatrures and lack of addtional loading has allowed the upper snowpack to strengthen significantly since last weekends storm. Triggering a windslab on leeward terrain at treeline and above is still a possibility. The facet layer above the February 4th rain crust is also healing but still harbors the potential to be triggered and should be given consideration in steep and open terrain above treeline. New storm snow and strong Southwesterly winds have created sensitive slabs in steep terrain above 5,000' on all aspects. Use caution on steep slopes until this new snow has had time to settle and strengthen. The region recieved a substantial amount of new snow and high winds over the weekend, over 20 inches in most places. We saw extensive windslab development in the higher elevations. Yesterday was a brief respite from those winds, but overnight they picked up to transport speed again and will be accompanied by another shot of precipitation today. Expect sensitive windslabs on leeward aspects and allow time for the storm slabs to stabilize. The new snow across the Selkirk and Cabinet mountains have made for some powdery conditions! Be aware of soft slab potential near and above treeline. The light snow on the surface isn't a big concern right now, but we're looking at 15-20'' more by this weekend. As more snow falls, your internal 'red light' should be getting brighter. Expect the avalanche danger to increase over the next couple days. The wind slabs and weak layers under last weekends' storm snow have strengthened significantly this week. The potential still exists to trigger an avalanche in these variable wind deposits and stubborn weak layers. Use caution in steep terrain, particularly on Southwesterly aspects. Weather forecasts are predicting significant storm snow Saturday thru Sunday so expect avalanche danger to potentially rise with new snow and wind. Snowpack is consolidating with light powder on the surface where it is not wind affected. Assess upper elevation ridgetops and wind affected areas greater than 35 degrees as it is highly variable. The storm slabs and wind slabs from the President's Weekend storms are still working on stabilizing after such a big and rapid load. Most areas are resting on a layer of weak facets and the slick rain crust sliding surface. When headed into the backcountry, use careful snowpack evaluation, cautious route-finding and conservative decision making. After a week of good snow and strong winds we'll be hanging out in a cold high pressure for the next 24 hours. There was a lot of reverse loading above treeline and near ridges. Areas that are normally thought of as leeward slopes may have newly formed wind slabs on them. We're getting initial information about a snowmobile triggered avalanche in Echo bowl yesterday. No details yet... Stay safe out there! Sensitive storm snow and wind slabs are resting on a layer of weak facets and a slick bed surface. Steep terrain (over 30°) should be avoided on all aspects and elevations until this new snow has had time to settle and strengthen. Currently 10 inches of recent storm snow sitting atop an ice crust. There is some wind affect and slight suncrust on top of the current surface. A series of storms will be rolling in with breezy conditions forming wind slabs and loading on Noreasterly aspects. Avalanche danger will be on the rise throughout the weekend with the brunt of the storm coming in Saturday. Red flags will be heavy precipitation and winds. The weekend is about to roll in with a bang weather wise. Going into Friday morning with an overall fairly stable snowpack, but the snow accumulation is going to ramp up throughout the day today and not stop until Sunday night. Storm totals could exceed 4 feet in areas and will be accompanied by strong winds. Expect the avalanche danger to increase throughout Saturday and Sunday. Significant snowfall and strong winds are two of the avalanche red flags. Expect avalanche danger to change rapidly going into the weekend with strong winds and heavy snowfall forecasted for Saturday and Sunday. This new snow will be falling on a multitude of weak layers that will take multiple days to settle and strengthen. The cold front that has swept through the region has done a good job of locking up the snowpack and increasing stability. The gusty winds we've been having created isolated windslabs on leeward aspects near our ridgelines. Heads up for the new storm coming in starting tonight, with the potential for over a foot of new snow to fall on a potentially slick bed surface.